Below are the different levels of accreditation that you can achieve. 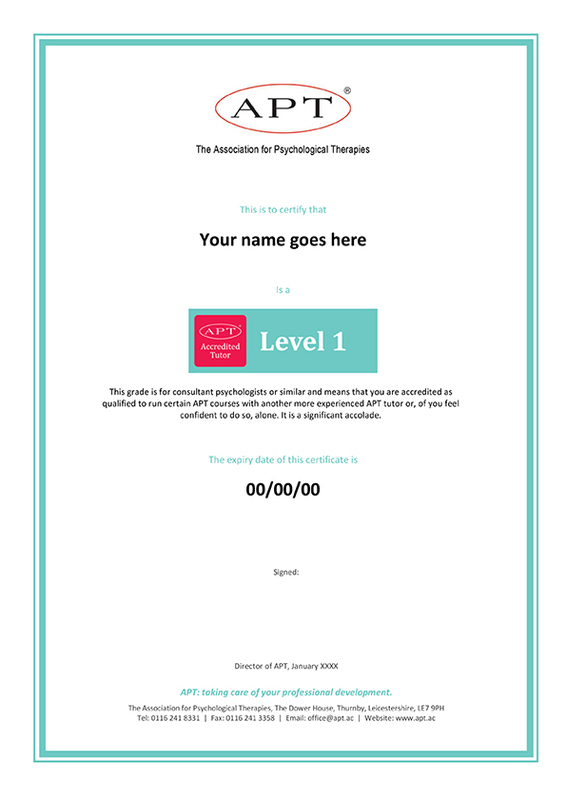 This is the grade designed to recognise people who, while not consultant psychologists or similar (the default grade for APT tutors) are talented people an organisation would want to have in a teaching role, often for a specific course. Assistant tutors are not permitted to run APT courses on their own, but are licensed to assist and teach alongside an APT-Accredited tutor. 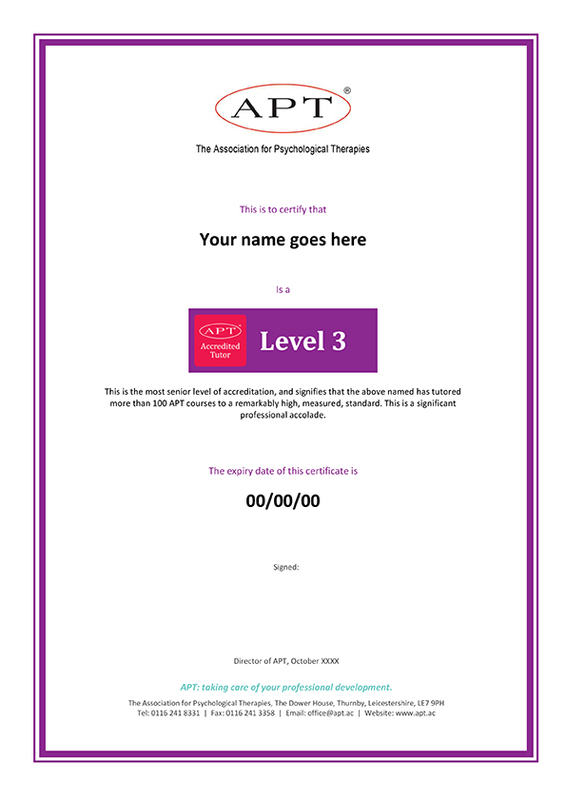 This grade is for senior clinicians (consultant psychologists or similar) with an aptitude for teaching and developing people, and means that you are accredited to run APT courses on subjects you know about. (Although the courses are well-established it's advisable to confine yourself to subjects you know about because there are often question slightly to one side of the course itself.) To gain Level 1 accreditation you need to have the required c.v. and references, and sit and pass APT’s online eLearning module on becoming a tutor. 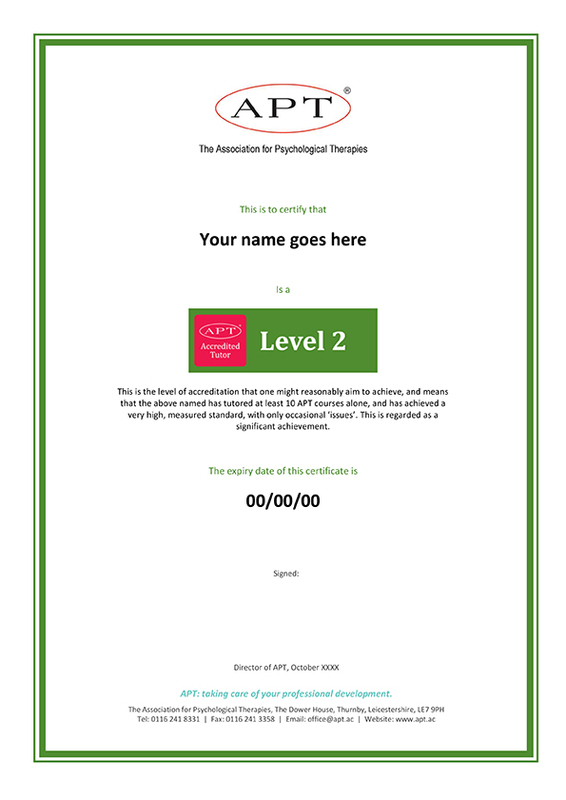 This is the level of accreditation that an accredited APT tutor might reasonably aim to achieve, and means that you have tutored at least 10 APT courses alone, and have achieved a very high, measured standard, with only occasional 'issues; a significant achievement. This is the most senior level of accreditation, and signifies that the person named has tutored more than 100 APT courses to a remarkably high, measured, standard. It is reasonable to regard this as a significant professional accolade. How do APT tutors maintain their accreditation? The accreditation of APT’s Level I accredited tutors lapses in they don't run a course for a period of more than two years. The accreditation of APT’s Level 2 accredited tutors lapses in they don't run a course for a period of more than three years. The accreditation of APT’s Level 3 accredited tutors lapses in they don't run a course for a period of more than five years. In each case, the courses run must be to the required standard.